Adam nominated for Best Actor! Here's a link to the Seven Days VT review of You Can't Take It With You at St Michael's Playhouse. I'll always be happy when folks think my work is "simply splendid." Thanks Seven Days VT! Just a little slideshow from YCTIWY at St. Michael's with some great shots. Check 'er out. Opening tonight at St Michael's Playhouse! I've had the pleasure to work here several times over the years, and I continue to find the most enjoyable groups of actors, designers, directors, and crew members to spend a few weeks with making a play. Come check us out until August 12! All the reviews in one place! When I was a a junior at Kenyon College my professors Tom Turgeon and Wendy Macleod taught a class called "Contemporary British Drama" which focused on 20th century playwrights from England. This was my first introduction to John Osborne, Shelagh Delaney, Pinter, and Martin McDonagh. We read The Cripple of Inishmaan in that class and I became hooked, in love with McDonagh's writing style, the voice of his characters, the unique humor somewhere between the Theatre of Cruelty (Artaud) and commedia, it all spoke to me. We then read The Pillowman and it only solidified McDonagh's genius for me, a world just as deep and complex, but set in the ether somewhere, not bound by geography. I read more of his work and fantasized about doing his shows, as most actors do when they read a play that has anything resembling a role in their range. A couple years later, upon graduating, I moved to New York City to make a go of it and try my hand as an actor, having just received my Equity card as an ASM. As it is wont to do, NYC didn't extend me any sympathies, so I began to look for any opportunities I could muster to be nearer to the community. I happened to recall being told at Kenyon that another alum of ours was the Artistic Director for the Atlantic Theater Company, which I didn't know anything about. I looked them up, and not only were they a powerhouse Off-Broadway theatre with decades of awards and success, they were at that very time hosting the Druid Theatre's production of Cripple at the Linda Gross Theater. Druid, a famed Irish company, has worked closely with McDonagh over the years, presenting most of his early works for the first time, and this was their revival of the show, brought to NYC by Atlantic. Neil was incredibly kind and generous, we spoke for a while and he offered to help me get an internship at the theatre, if there were availabilities. He also gave me two tickets to go see Cripple, which I snatched up immediately. I ended up taking that internship, in Development, which gave me a wealth of experience and knowledge about the operations of a theatre company, and put me in touch with some amazing people. It was while I was there that I helped my friend, Rachael, audition for grad school and was unexpectedly asked to apply, a story for another time. But out of all of that I can remember, almost more than anything else while I was there, the experience of seeing that incredible play for the first time. It was enlightening, hilarious, moving, and real. I had never seen theatre Off-Broadway at the time, and hadn't seen much on Broadway either, and I was euphoric at seeing those incredible words brought to life. I didn't know these actors, these designers, this director, I could only sit back and see it as it actually happened, and I'll never forget that feeling of possibility it aroused in me. Flash forward several years and I had kept my eye out for The Cripple of Inishmaan whenever possible, but nothing ever really popped up. In grad school I took the free stage time I had in class to work on scenes from the show, and from another McDonagh play that should be produced more often, Lonesome West. I got my first taste of playing in that world and I liked it, I felt natural and alive in it, and the enjoyment of playing the massive waves in his writing translated directly to my classmates and teachers as an audience. At the audition I re-met Kim, the Casting Director, and J. Barry Lewis, the director. I also ran into some acquaintances from The Irish Repertory Theatre, where I had worked in 2015 for my first time Off-Broadway, the community of people doing Irish theatre in New York being quite connected. I did the scene a few times with some of these folks, and continued to play, J. Barry helping me along where needed, but not offering many notes to me specifically. I felt good about the audition, and as I was leaving J. Barry called me back in and asked if I knew about Palm Beach Dramaworks (at that point I had also submitted for the show immediately preceding Cripple in the 2016-17 season, Stoppard's Arcadia), and whether I could sustain the physicality and the wheeze. He also told me I was too old for the show on paper, but that it didn't seem to matter when I got up to do the part. As I left he told me I'd be getting called back for the next day to work with it some more. When I got to the callback I was feeling strong, and then walked in to a group of guys all vying for the same role. At the first audition it had been mostly people reading for Babbybobby, so this was a new group. But the best you can do is what you know, so I prepared to go in, trying hard to nail the physicality and revisit what I had learned from working on the play in grad school. After playing a few times, J. Barry told me they had seen a lot of people for the role and I was the first that really understood what the play was about, stylistically and emotionally. I took that as a good sign and went on my way. The call came a few days later and I got the part, I was ecstatic. I didn't know what to expect from a new place when coming to Palm Beach. I'd never been to the area, didn't know the cast or crew, had never been to the theatre or seen their work. Any reservations I had were lifted within the first few moments of seeing how well they do things at PBD. We rehearsed, and as we rehearsed J. Barry made sure to allow time for us all to get to know each other and just gas. As I worked with him one on one he allowed me to explore, supported me fully in my work and pushed me to be better in it. A few days before opening we weren't happy with a monologue in the show and I spent 40 minutes going over it in the incoming tide of Delray Beach, hoping the rhythms of the water would replace my own ingrained ones I couldn't seem to shake. The next day we rehearsed it and the monologue landed, finally. A weight was lifted from my shoulders and I finally felt ready to play, to explore every beat and moment, and to work with an audience to find the light and dark in the play. Now here we are, a few weeks in and a few days from closing and I am overwhelmed with sadness at seeing this production end. The people, the work, the environment have been the best I've ever experienced, and I have never been more proud of a show. Audiences are surprised every night by how deeply they are moved by a play that masquerades itself at times as an Irish farce, and we've had reviews popping up every couple days lauding the entire production and urging audiences to see it. I don't know about all of that, but what I do know is that I will forever be grateful to have been part of something so strong. I have waited over a decade now for this opportunity, one I didn't even know I wanted to badly, and now that it is come and almost gone I can only offer my thanks and this little story. Now that Da has closed it's on to some new projects, with hopefully more to come. First, last night I appeared in Misalliance, as part of the Gingold Theatrical Group's Project Shaw. It's a great series, a once-monthly get together for a reading of one of Shaw's plays. The audience is so supportive, and regularly fills well over a hundred seats. It's a great environment to work in as well, a single-day rehearsal and performance but endless encouragement to just go for it and enjoy one's self as an actor in the play. Anyway, had a load of fun. And if you haven't checked out Project Shaw give it a glance here. Their commitment to the work is outstanding, but even more impressive is that they use it as a way to contribute to other charitable causes around the world. And next is another reading, this time of a new play, which coincidentally will feature me doing some dialect work again(can't seem to shake it lately). It's called The Boy in the Painting, and we'll be reading it at Chelsea Studios this Thursday the 9th of April at 7 pm. The reading is free and open to the public so come on down! I'm Signing With Bret Adams LTD! I am very very happy to be able to announce to everyone listening that I have been signed by Bret Adams LTD, one of the premiere boutique agencies in NYC! Ken Melamed and Margi Rountree will be handling my bookings now, and you can find more info about the agency here. My profile is on their site, and you can check that out here. I've had my eyes on this particular agency for years now, and I can't really express how excited I am. And I owe a lot of thanks to the group of people who put in recommendations to them and helped me out. You know who you are. Thanks everyone, stay tuned for more news! 8 Shows Left! 1 Week! Hey everyone! As I'm sure you know as you've been glued to this blog day in and day out for months, Da closes April 5th. That means we have one week of shows left, 8 more and then we're in the can, so to speak. Now there may be some more exciting news to come, but for now...COME SEE THE SHOW! If you haven't already or if you want to see it again, come check it out before you can't anymore. Thanks everyone for all your support and a double thanks to everyone who has come to see the show, and there are a lot of you to thank for that. Da to be preserved in Lincoln Center Library! Another round of good news for Da at Irish Rep. Lincoln Center has asked to come film the show to be preserved for all eternity in their library. For those of you who didn't spend way too much money for a theatre degree in New York, the Library at Lincoln Center holds every Broadway production for the last 50 or more years, and they request certain other performances to have a record of that play, director, design, or other. Students and theatre professionals from all over then use those records as a guide when thinking about that play, or even just as a way to spend an afternoon. The copies are kept at Lincoln Center only for copyright purposes, but are available to anyone with a library card. So from here on out I'll be at Lincoln Center doing Da. Tickets are getting snatched up but our evening shows have some availability. Come check it out! Da Extends Through April 5th! Very happy to announce that Da will be extending for an additional four weeks of performance. We were originally set to close March 8th, but will now wrap things up April 5th. So those of you who have yet to see it, or were worrying about ticket availability, now is the time to jump on the wagon and reserve your seats for the show. More info at Playbill and of course in my other posts about the show. As always, let me know if you can make it, and I'll try to help you find the best deal for tickets. Ok I know I know, lots of plays and people get in the Times, and it's a review of our show, which is hardly something I can claim. 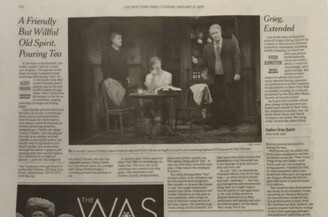 But today a show I'm in made the back page of the arts section of The New York Times, with my picture right there. The back page, with the crossword, which I sat and worked on for many hours during college and grad school. Hopefully there are more to come. I'm humbled to have made even an appearance in something with that kind of history. I'm gonna stop looking at all the reviews now and keep my head down and focused. But the good folks at Irish Rep are keeping track, and have posted them all here. Thanks everyone, all of you who have seen the show, will see it, and everyone else, for helping make my day. After 10 previews, three instances of a broken door onstage, a few light changes and scene tweaks, we officially opened Da last night to another sell-out crowd at DR2. The night was a great success, including the after party, meeting a bunch of loyal fans of Irish Rep and seeing just how great a community they have built in what is one of the most competitive and often unfriendly towns for non-profit arts institutions. The show has been selling out steadily, so if you can make it be sure to reserve now, or send me an email and I'll help you figure out the best option for getting tickets, as there are a few. I'll leave you with our first review, from the NY Daily News. First performances of DA begin in a week! When I found out I'd be doing this show about six weeks ago, January 14 seemed like years away. Until now, I've never rehearsed a show professionally for more than 10 days, considering most summer stock schedules. But, as is always the case when you're having fun, time has flown by, and we have our first performances in a week. I've said it before, but this is a great cast and crew, and a great show(although the accolades bestowed on it speak for themselves), and it's definitely worth a watch. So here's the deal: first preview is January 14 at 3pm, and another that night at 8. We take Mondays off, but run 8 shows a week, doubles Wednesday and Saturday, and a matinee on Sunday. Tuesday shows at 7. Tickets are $71, but day-of tickets are available with a student ID for $25. More details and the link to purchase tickets here. All shows at DR2 off Union Square, 101 East 15th Street, New York, NY 10003. I am very happy to announce that I have been cast in Irish Repertory Theatre's Production of Da. Written by Hugh Leonard in 1973, the show is a largely-autobiographical re-telling of his life as a young man in Ireland during the 40's and 50's. The show follows Charlie, who has returned to Dalkey for the funeral of his Da, his last surviving parent. While he cleans the house and prepares to return home, he is visited by the memory(or ghost, or maybe consciousness) of his parents, his former self, and the characters that surrounded his upbringing in a small town on the outskirts of Dublin. I'll be playing Young Charlie, his former self age 17-30 in various stages. The show is directed by the Artistic Director of Irish Repertory Theatre, Charlotte Moore, and sports an equally talented cast. I won't go into all the names, as you can see them here, but the rest of the gang are incredible, and have all been doing this for years Off and on Broadway, in major films and TV, and I can only imagine what else. We being previews January 14th, and open the 22nd. Closing night is slated for March 8th, but I'm hoping there's an extension in there of some length. We'll be performing at DR2 off Union Square, as the Irish Rep mainstage is currently undergoing renovations in the area of about $8Mil thanks to a huge capital campaign that has been taking place over the last couple years. 8 shows a week, I hope you can come check it out. More to come on it as we continue rehearsing and working. So after a good few years it's time to upgrade the old website and other marketing materials. I'll be updating this blog with news about shows, and hopefully some other content tangentially related to my career, although I have to admit upfront there is a good chance food will be of secondary concern after my acting exploits. If you are an actor, producer, director, writer, follow me and we can get communal with this experience. If you click the little button above that says "Blog RSS" you'll be able to subscribe to the RSS feed for this page. I'm also looking for representation and more opportunities to play make believe to if there is anything you have in mind shoot me a message.